In a room as well-frequented as the bathroom, the materials you choose to use can make or break not only the functionality of the space, but the aesthetic too. While you may originally opt for materials simply based on their price, or the way that they look, this can eventually turn out to be a dire mistake. Instead it is a better idea to do a little research on which materials are the most durable and will help you to achieve an efficient bathroom. Plastic wall cladding is the perfect alternative to scrubbing mouldy grout, as not only is it waterproof and mould resistant, but its affordable, as well as easy to install. If you are afraid that wall cladding won’t look as trendy as tiles, then think again. Cladding is also available in various stylish patterns, with a high gloss finish. This works to avoid the outdated look that can be found with tiles and bring your bathroom up to speed. Choosing waterproof bathroom flooring ensures functionality. This option will keep your bathroom in tip-top condition, as it can easily be wiped clean, unlike carpet or floorboards. With this flooring there is no need to worry about splashes and spills seeping into the woodwork, as any water can just be mopped straight up. As well as this, waterproof flooring can be purchased with a wooden appearance if you don’t want to let go of the natural look. Bathroom radiators made of aluminium may be more expensive to initially install, however, as this material is a super conductor it will easily save you money in the long run. Not only can aluminium reach maximum temperature much quicker than other radiator options, but it takes a lot less water to function. Paired with the fact that aluminium is recyclable, this makes these radiators are great choice for an eco-friendly home. Alongside these benefits, the sleek appearance of aluminium will add a touch of class to your bathroom. In modern times, the world has seen a rise in acrylic baths and splash backs as they are cheap to buy and warmer to the touch. However, there are plenty of reasons why when faced with the choice of a steel or acrylic bath, you should avoid the latter. Not only are their steel counterparts easily recycled, but they are much more durable than acrylic, meaning you run less risk of damaging them during installation. Another plus is that steel serves as a heat conductor, meaning that the metal won’t stay cold for very long and will keep you toasty warm in the tub for longer! 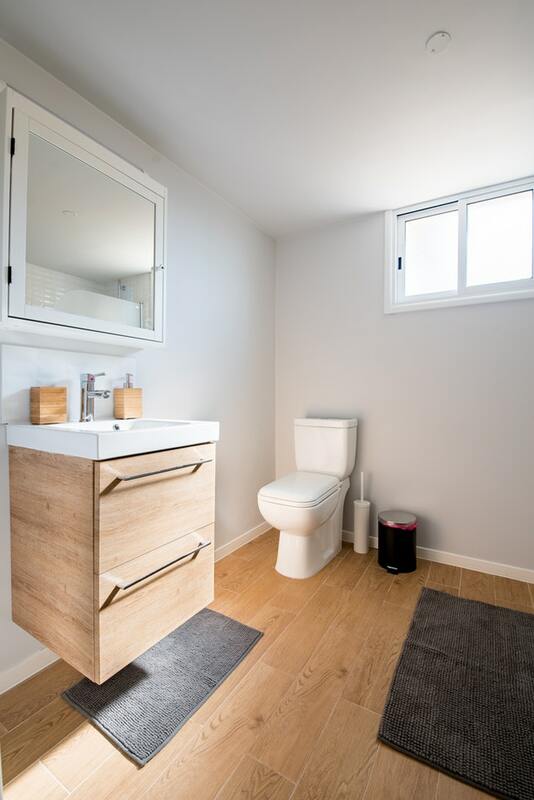 Though wooden flooring was once a traditional bathroom choice due to the low price and ease of installation, modern design means that there are much more durable options available now. 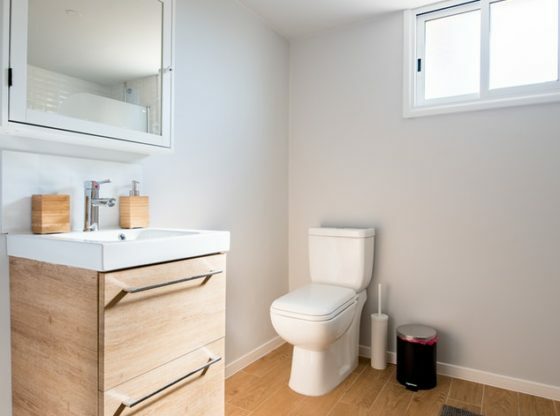 The previously mentioned waterproof bathroom flooring won’t attract mould and become a safety hazard as it begins to rot, which is a notorious trait of floorboards. You may think that tiles are the perfect choice for a bathroom, but in time, you may regret this decision. With tiles you may find that you need to deep clean the grout daily to keep them sparkling, making them more trouble than they’re worth. On top of this, tiles are not great for insulation and may mean that your bathroom is a lot colder in the winter, making stepping out of the shower a lot more difficult. While this is a great choice to personalise other rooms in your home, wallpaper in the bathroom can often lead to disaster. Your perfect patterned walls can quickly be destroyed by black spots and creeping mould. As well as this, it can begin to peel, giving an impression of disrepair rather than a relaxing paradise. Selecting carpet for your bathroom may seem like a sure-fire way to keep your toes warm when you get out of the bath, but putting water and carpet together is a recipe for disaster. A soggy fabric bathroom carpet will not only take time and effort to dry but can very quickly become mouldy and begin to affect the flooring underneath. This will eventually lead to you needing to rip it up for repair, meaning it is better to avoid it in the first place. There you have it, the best and worst choices for a fully functional bathroom, that is also pleasing to the eye! Consider these tips when designing your room, and you are sure to be happy with the finished results.